The National Council for Promotion of Urdu Language (NCPUL), an autonomous organisation under the Ministry of Human Resource Development, Department of Secondary and Higher Education, Government of India, has been set up to promote, develop and propagate Urdu language. To meet the above objectives the Council has decided to launch a Certificate Course for learning Urdu through the distance mode. The learning materials have been specially selected by a team of experts drawn from different Universities and Institutions as well as the in house experts. 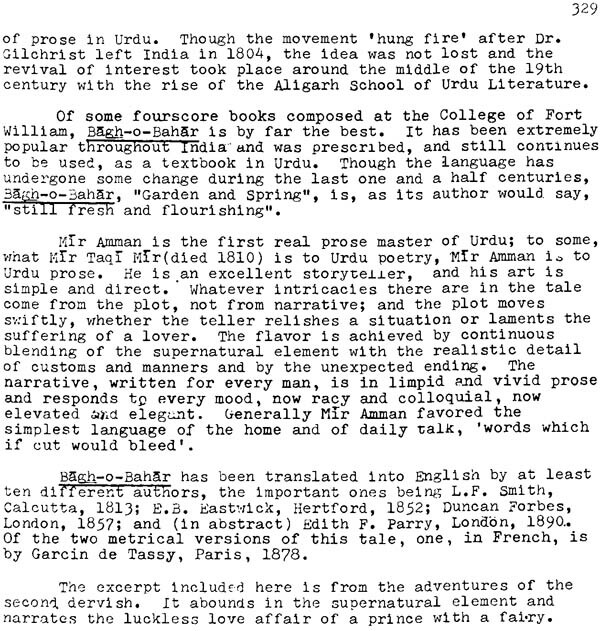 I must express my profound thanks to Prof. Gopi Chand Sarang for allowing the National Council for Promotion of Urdu languages to publish an Indian edition of his famous anthology, Ur& Readings in literary Urdu prose, which initially was published by the University of Wisconsin Press, Madison and London in 1968, and was available later on microfiche. During these thirty tee years it has been widely used globally in places as far apart USA. Japan, Norway and Turkey. 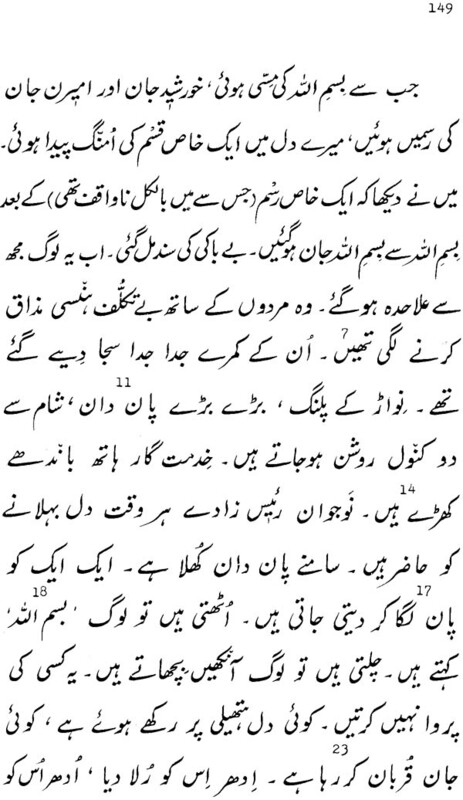 An Indian edition of this time—tested reader as a self study material will be a valuable addition for students who wish to enhance their knowledge of Urdu. I hope this edition will be of great interest to students who have an elementary knowledge of Urdu, and wish to enjoy reading some of the best pieces of literary Urdu prose. 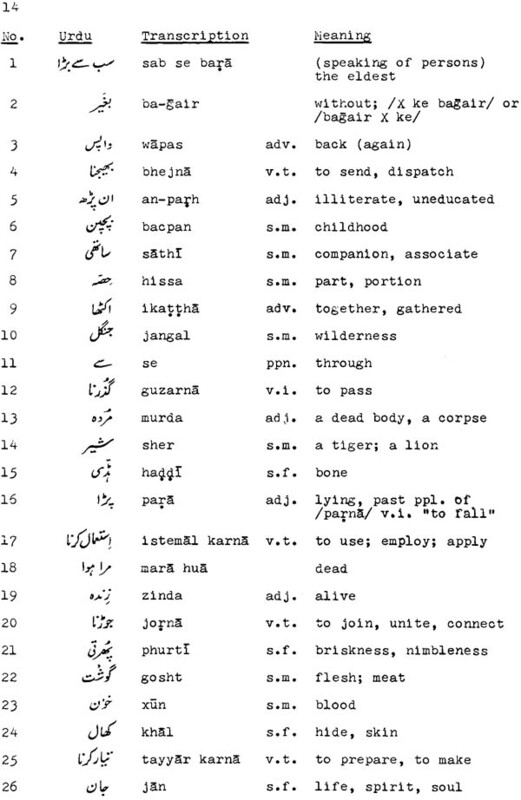 The materials currently available for the teaching of the Urdu language are either elementary or advanced. The primary purpose of this reader is to bridge the gap between these materials and to supply an intermediate reading aid to students who wish to increase their vocabulary and reading proficiency beyond the elementary stage. 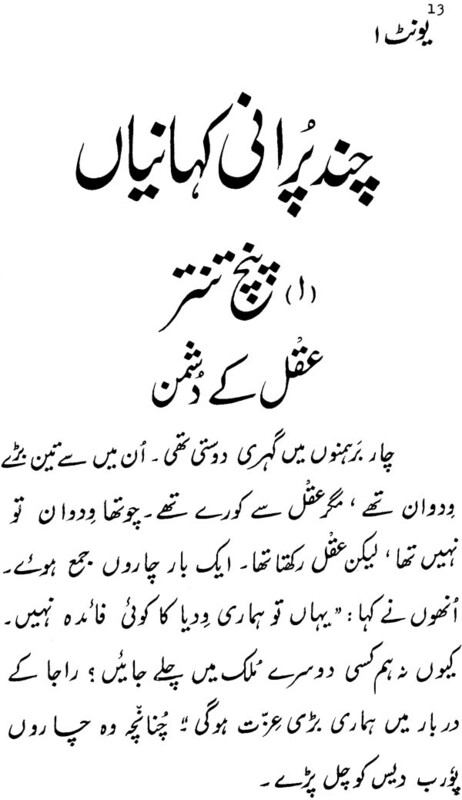 Its secondary purpose is to integrate with the language instruction an appreciation of those features of culture and literary tradition which are most pertinent to the Urdu language. The selections present a wide range of subjects and styles—folklore, novels, short stories, literary and humorous essays, anecdotes, letters and historical and biographical writings, as well as parliamentary speeches and debates. Both classical and modem writers, most of them of the twentieth century, are included. The selections are arranged in order of increasing lexical and stylistic difficulty. It is suggested, therefore, that they be read in the order in which they appear in the table of contents. An additional list of contents, arranged chronologically, is provided to enable the student to place the authors in correct historical perspective. To aid the student further, each selection is introduced a short note on the author and the work involved. Since in toto presentation of the selections would have exceeded the skills of the intermediate student, they have been abridged or slightly revised to replace low-frequency and archaic words and expressions with comparatively high-frequency words and expressions. Of course, care was taken to see that the changes did not alter the original meaning of the selections, or style of the author. 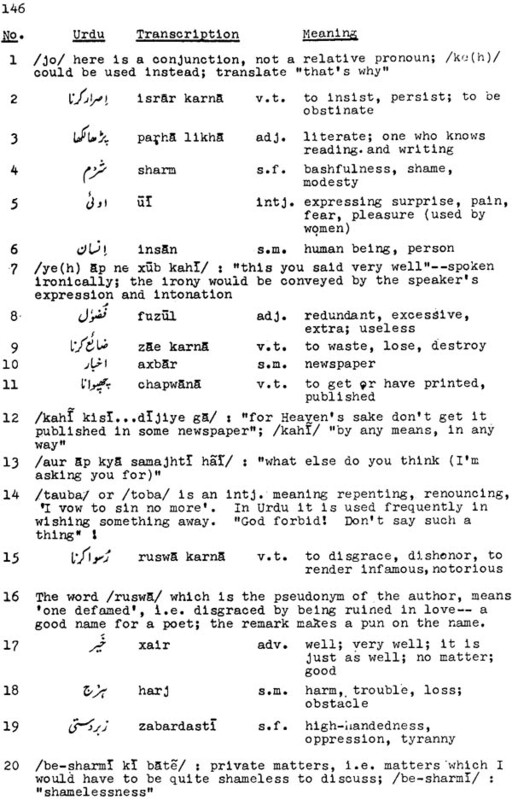 Unlike most of the Urdu teaching materials, this reader employs a serial glossary. 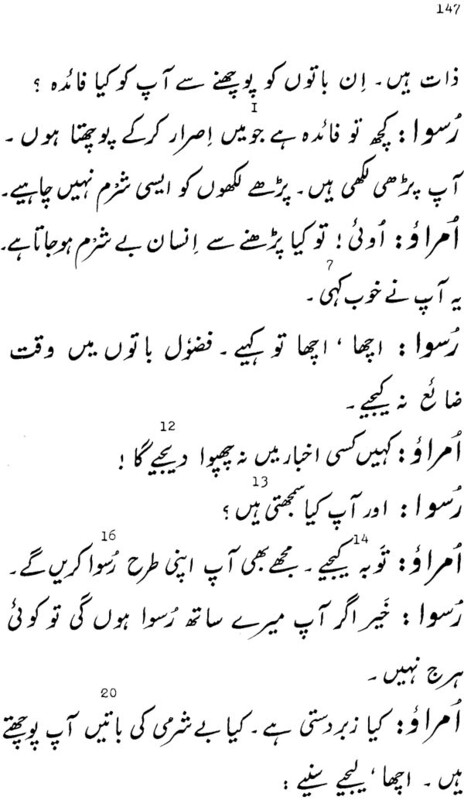 It appears on pages facing the Urdu text, with items arranged in the order in which the student working through the text will need them. Glosses once listed are not given again. Close-listed words and words commonly occurring in the elementary materials have not been included. Explanatory notes on special grammatical features, dialect variations, idioms, stylistic constructions, and historical and cultural information also appear serially on the glossary pages and are numerically keyed to the text. Though the purpose of serial glossing is to relieve the student of the drudgery of ‘dictionary-thumbing’, the student should not rely on it too heavily. A comprehensive glossary has been avoided as it generally proves to be a poor substitute for a dictionary. The first two units consist of adaptations from Indian and Middle Eastern folklore, i.e., from Panchatantra, Jataka, Masnavi-e-Rumi, Gulistan-e-Saadi, and The Arabian Nights. 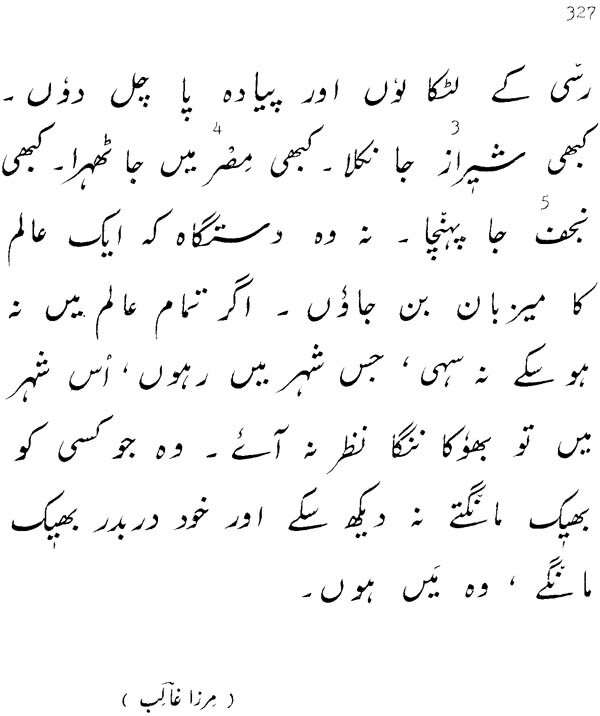 They were written by the compiler of this reader in a clear and simple style for the purpose of affording the student a smooth transition from elementary Urdu to the intermediate selections which follow. 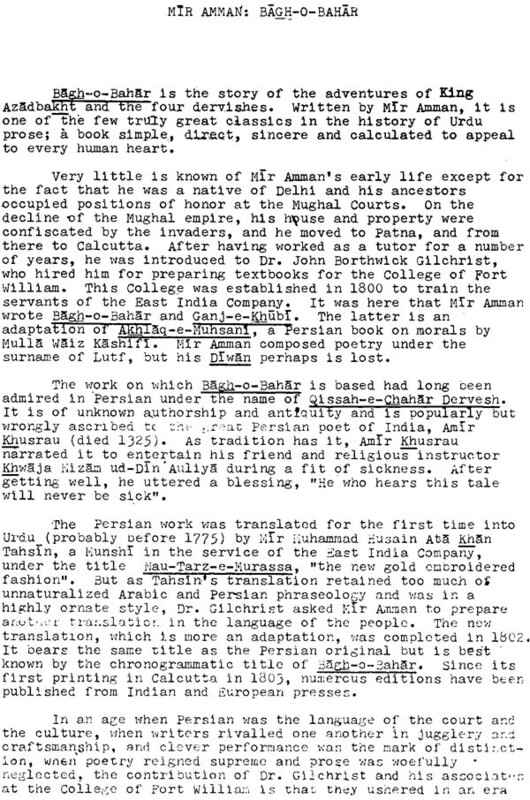 The essays on Sir Sayyid Ahmad Khan and Premchand were written in an easy style especially for this anthology. The text provides a regular one-year course: approximately three classrooms hours per week with some extra time for composition. 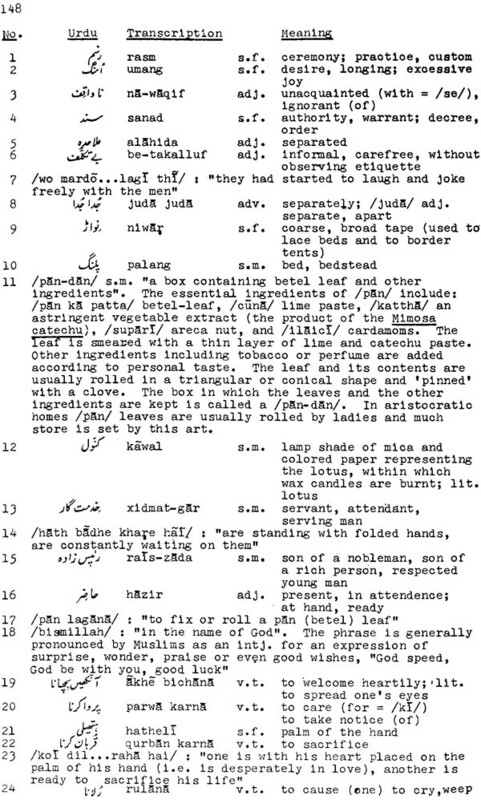 It can be used in a second-year course where students know Urdu orthography and have learned elementary Urdu through the currently available introductory or elementary material. It will in turn lead them to more advanced Urdu readings or to Urdu readers whose selections are presented in an unaltered and unabridged form. It can also be used as a convenient review by advanced students. 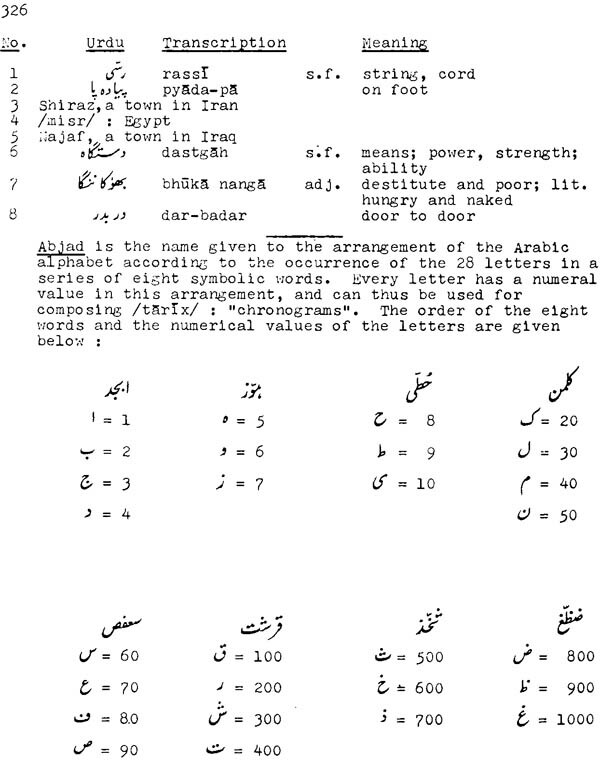 This was the first Urdu reader published in the United States in Nastaliq calligraphy, the form in which Urdu is most commonly printed. The calligraphy was done at Delhi by one of the best exponents of this art. 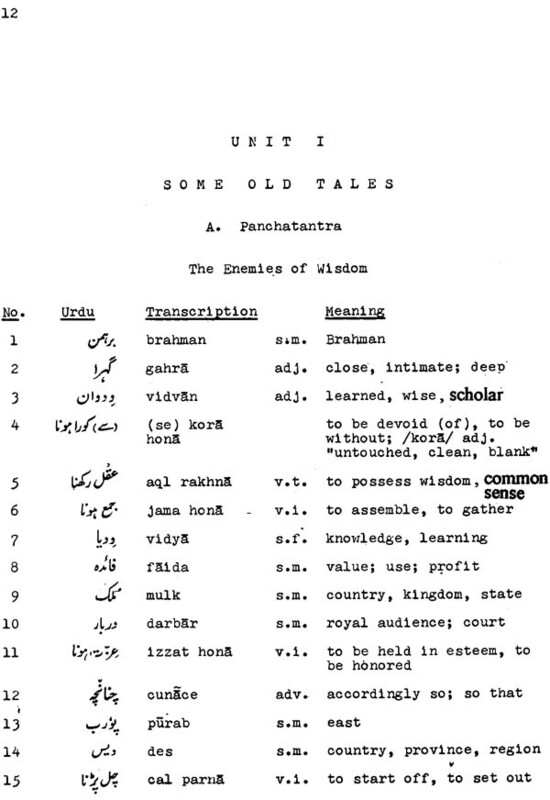 The orthographical conventions used are those favoured by leading Urdu scholars. 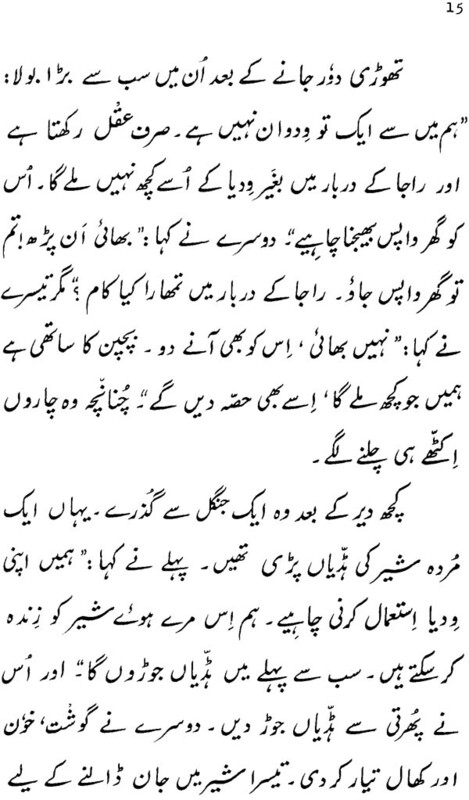 A note explaining Urdu orthography appears on pages 5-7 below. In conclusion I most sincerely thank those friends and colleagues who helped in one way or another to make this reader what it is. It has been my particular good fortune at the University of Wisconsin to be a colleague of Professor Richard H. Robinson, whose suggestions helped greatly in making the selections and in developing the glossary. The reader owes much to the inspiration and interest of Professor Henry C. Hart, Chairman of the Department of Indian Studies of the University of Wisconsin. I am also indebted to Professor Joseph W. Elder of the Department of Sociology and Indian Studies of the University of Wisconsin, Professor Gerald Kelley of the Division of Modem Languages of Cornell University, and Professor K.A. Faruqi of the Department of Urdu of the University of Delhi for providing me with an opportunity to work with the Wisconsin students, first at Delhi and later at Wisconsin, and thus exposing me to the problems of teaching and Learning Urdu as a foreign language. Dr. M.A.R. Barker of the Institute of Islamic Studies at McGill University, Mr. Bruce R. Pray of the University of California at Berkeley and Mr. Joseph A. Reif of the University of Michigan relayed to me the difficulties encountered by their students and made valuable comments on numerous points. For the selections, I had the benefit of suggestions and help from many friends; among these special mention should 1w made of Dr. Nisar Ahmad Faruqi and Dr. H.C. Nayyar. I should like to acknowledge the assistance of Mr. Malik Ram, who helped In the formulation of conventions used in the orthography. Mr. Atique Ahmad Siddiqui assisted in abridging the texts and preparing the glossary. My thanks are also due to the authors whose excerpts have been included here. Special among these are Dr. Zakir Husain, the President of India; Dr. Sayyid Abid Husain, Jamia Millia Islamia, Delhi; Professor Rashid Ahmad Siddiqui and Professor Ale Ahmad Suroor, both of Aligarh Muslim University; and Professor Ehtisham Husain, University of Allahabad. I am also greatly indebted to Mrs. Doretta Hilander for preparing the original English manuscript and graciously assisting new in unrecountable ways; and to Mr. RN. Nigam for undertaking the dreary task of typing 4w final English copy. I wish to acknowlege further, with pleasure and gratitude, the contributions of my students at the University of Wisconsin, who heartily participated in the task of classroom testing some of this material and who taught me, in many cases, perhaps more than they themselves learned. Finally, major acknowledgement must go to the late Dr. Ripley Moore, who for much of the time worked with me in the preparation of the glossary. Death came to him in Mussoorie, Uttar Pradesh, India, on May 25, 1966, while fighting a mountain fire. He was a very kind, conscientious and generous person, and will be sorely missed by all who knew him. Death came to him when he was at the prime of his life and his work, and now that the curtain is drawn, as Pope put it, ‘till tired, he sleeps’ overlooking the snow-covered Himalayan peaks, only a little distance away from the renowned Hindi grammarian S.H. Kellogg, who also died accidentally in Mussoorie.